Members of the Assembly, ladies and gentlemen, brothers and sisters, On April 11, 1995, 50 years to the day of the liberation of the Buchenwald concentration camp, I was invited to Buchenwald, very near Weimar - the city of culture in Germany, eastern part of Germany. Buchenwald was a suburb of Weimar. It is an eight-minute walk from the National Theatre of Weimar, the city centre, to the gate of Buchenwald, where a slogan is written on the gate: "Everyone to His Destiny". Fifty years later, not very many survived Buchenwald, and survived those 50 years, but still there were hundreds of survivors, and I was privileged to speak on behalf of them. "Look what a change! This is my second "visit" in my life to Buchenwald. I arrived here in January 1945, a child of seven-and-a-half years, together with my older brother Naftali. We received two numbers, one after the other. H?ftling [in German] refers to a prisoner, number 117029 and 117030. I lost my identity. I was nobody. I was a number, a heftling. Now, in my second visit, fifty years later, in April 1995, I come from my independent state. 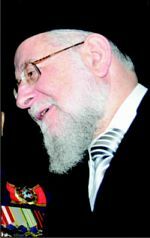 I am a citizen of the State of Israel, founded in 1948, and I am in fact its Chief Rabbi. Not a nobody, but a somebody. I am not a number anymore. So you will agree - that is a real change during those fifty years. Maybe you will say, "It's a time to open a new chapter; let's forget, let's forgive, let's open a new chapter in mankind's history. So I came to tell you, "We cannot forget, it's impossible to forget, and we are not authorized to forgive". Even if I am a man of forgiveness, of kindness and so forth - I have no mandate to forgive on behalf of my father who was murdered in Treblinka at the age of fifty with my brother Shmulik, a child, Bar-Mitzvah boy, thirteen years old. I have no mandate to forgive for my mother, who died of torture and starvation and disease in the Ravensbr?ck concentration camp, at the age of forty-four, or on behalf of my forty-two murdered cousins. Can I forgive?!" Ten years after the visit to Buchenwald, the United Nations was clever and kind enough to declare the 27th of January, the day of liberation of Auschwitz-Birkenau by the Russian army, the Red Army - as an international day of commemoration to remember the victims of the Holocaust. Sixty years after the horror - better late than never. I want to share with you some of my thoughts: First of all, nothing can be compared to the Holocaust. Nothing. Disasters, wars, nothing compares, not only because of the numbers, not only because of gas chambers, but because of the systematic task of liquidating a nation, and declaring that task in advance, giving warning to the world. In 1923, when Hitler's book, Mein Kampf, came out, he said it clearly: He wants to liquidate the Jewish people. Ten years later he democratically became the Chancellor, the ruler of Germany. In 1935, the Nuremberg Laws were put into effect by the Reichstag. Jews gradually lost their rights to possessions, to freedoms, to a life. Hitler tested the world to see its reaction to the Kristallnacht pogrom on November 9, 1938. 15,000 synagogues burned in flames; 30,000 Jews were sent to concentration camps like Dachau, or Buchenwald. What would be the reaction of the free world? What would it say? What did it say? Now we know: almost nothing. Three years later, came Babi-Yar. 99,771 victims, children, babies, and women were told - "Take your property, whatever you can carry with you, to a new settlement." The new settlement was in the city of Kiev, and you can see the valley today. What was the reaction of people all over the world? Almost nothing. Months later, after Babi-Yar, the Wannsee Conference took place near Berlin. "How to liquidate the Jewish people?" Not if, but how. Heydrich, Eichmann, and others asked: "How will you arrange for the liquidation?" They called it "The Final Solution." The world needed a solution, and the solution of the problems of the world would be liquidation of the Jewish people, because we were prisoners, international prisoners. We've come to speak also about anti-Semitism. This day, of the 27th of January, was set by the UN not only to condemn anti-Semitism, but also to look for ways to defeat it - if that is possible. Anti-Semitism is a spiritual disease, it has nothing to do with logic. It's a-logical. Because when they liquidated 1.5 million children - did those children threaten Germany? Were they enemies of the National Socialist Party, the party of the Nazis? Did they endanger anyone? Why were we the target of the liquidation? Did we threaten any nation in the world? Did we have an army? Did we have a rifle, a pistol? Did we shoot rockets, kassams, grads, scuds, missiles? What did we do? Why did you hate us? Why did you kill us? Some of those who were in Poland back then said that it's because we seem strange to and different from the Polish people. We don't always know the local language, don't wear the same clothes, we have beards, black hats. If we would be like the others, we would be welcomed, they would embrace us. Society would say, "Welcome! You are talented, productive, intelligent, you are like us." So the story went that they hate us because we are different. Yet next to Poland was Germany. There we didn't wear black hats, we spoke beautiful German, and we contributed the best of our people to German culture and society. Like Albert Einstein, the Mendelsohns, scientists, doctors, physicians, artists, teachers, authors, poets. Heinrich Heine was also Jewish, as was the last pre-Nazi German Minister of Foreign Affairs. And the Rothchilds were also Jewish. So where we were like them, did they love us? Did they embrace us? So in one place you hate us because we are different, and in another place you hate us because we are the same. Can you make a decision what you want from us? In Europe you said "It's not your home, we hate the foreigners, go to your home and we will embrace you!" So we went to our home. First of all, you didn't let us in. You sent us back to Europe, on the ship "Exodus". You sent us to exile in Cyprus, in Mauritius. Finally we came home. Now that we are in our home do you love us? Ask our neighbors. So this is the day designated to fight anti-Semitism. But it's beyond logic. I had a friend, the Holocaust author Yehiel Feiner-Dinur, who is well-known by his pseudonym, "Ka-Tzetnik". He wrote several books as a survivor of Auschwitz. He told me, "I don't write my books with ink, I write them with my blood." And he was isolated from people and society. Only one time in his life, after the Holocaust, he went out, to give testimony at Eichmann's trial. For the trial of Adolf Eichmann in Jerusalem, which was a unique event, Yehiel came out of his flat to be seen among people, though he had never before appeared in public. People told him, "For history's sake, for the memory of the victims, for your family - you owe it to them. Go and tell them what you saw." He spoke for two minutes at the trial and then fainted; fell right on the podium, onto the microphone. This happened when he described what he had seen, how the trains used to come to Auschwitz and [Dr. Josef] Mengele stood there to make his selections, with one finger "Right-left, right-left", which meant "life-death, life-death"… And my friend sensed at the trial that he saw his sister there, at the train and he screamed out: "I see, I see!" like a broken record. Then he fainted and he couldn't continue. He was taken to the hospital. During those two minutes of testimony he uttered only one thing: "Auschwitz was another planet. It's not a part of this world. A planet where children have no right to live, where flowers have no right to grow. A different planet." I met "Ka-Tzetnik" several times later. We were neighbours. His brother David had been shot dead right next to me on my way from Czenstochowa, to the train that took us to Buchenwald, in the end of 44'. I told him, "Yehiel, I disagree with you, completely. You say it was a different world, another planet. It's too easy to say that it was another planet. It was here in our planet, our people, they looked like us. They liked music, philosophy, literature, theatre, all kinds of arts. They were like us, human beings. They could kiss their own children; our babies - they would tear into two pieces, and I saw it". You cannot escape from the story of the Holocaust, saying it happened somewhere on another planet. These were human beings like us, and if they could do it, if they could behave like this - we have to investigate how, and promise that such a horror will never re-appear again. The world of that time was divided into sectors: murders and victims. [There were] those who supported, helped and assisted the murderers, [including] many people of many nations, especially in Europe. The majority of humanity kept silent. They didn't assist, they were not pro-Hitler, unlike the Mufti of Jerusalem, who went on November 28, 1941 to Berlin, to encourage the murderer Hitler: "Go ahead, liquidate the Jews." This [happened] before we had the problem of "occupied territories" as they call it, no problems of refugees, no problems of borders, no Golan Heights, no West Bank, no Gaza Strip. The Mufti of Jerusalem, a so-called religious leader - Haj-Amin El-Husseini, was the only religious leader in the world who went to Berlin to encourage the liquidation of the Jews. But the rest of the world, the majority, kept silent. To behave normally in an abnormal period is abnormal, and the world behaved very normally. One delegation of four hundred rabbis went to Washington D.C, to the White House, to demonstrate. The Bergson Group was important, but too small. Where was the world? After the Evian Conference, in 1938, almost no country in Europe found the room to settle even one thousand Jews. The Jews were already in danger, in Germany, which had already joined Austria, after the Anchluss, and the Sudeten people of Czechoslovakia became a part of greater Germany. People said then, "The Jews are under threat of their very existence. Let's find a place for the Jews to settle among us." The Netherlands and Norway found a bit of space for one thousand Jews. All the rest of the countries unfortunately said, "We have no place for the Jews." From that moment, after the Evian Conference, the Kristallnacht pogrom, and Babi-Yar, Hitler understood he could go further. He could go ahead. This is the lesson that the United Nations and all of mankind has to learn from those years of darkness. Not only Auschwitz, but rather what led to Auschwitz, what enabled Auschwitz to exist in this planet and not on a different one? The question is: Have we learned something, sixty-four years later? On this day, sixty-four years ago, the Red Army entered through the "Arbeit Macht Frei" gates of Auschwitz-Birkenau. Sixty-four years is enough time to learn a lesson. Have we learned the lesson? Two million children of Biafra in Africa could die of starvation twenty years ago, two million babies, innocent children, and what did the world do? One million people were killed in Kosovo ten years ago, in Europe a one- hour flight from Munich. For what? For what reason? It could and did happen, fifty years after the Holocaust. This means that we have learned nothing from the Holocaust. We have to study, from the very beginning. I keep in the pocket of my shirt, close to my heart, a small piece of paper. I have kept it for two years, and I will show it to you now. February 21, 2007, the 30th of the Hebrew month of Shevat, almost two years ago. An Israeli newspaper quotes from the United Nations, from this building, a statement made by the Head of the World Food Program, James Morris. What did he declare at the UN? What report did he give? That every day 18,000 children die of starvation in the world. Every day. Since this commemoration here today started, over one thousand children have died of starvation, mainly in Asia and Africa. This [tragedy] can happen sixty years after the Holocaust. Innocent babies and children. Not Jewish. Human beings. If this can happen there is proof that we have learned almost nothing from the Holocaust. As I said, I have carried this [news clipping] with me for two years. For me there is also a lesson in the fact that this testimony is not on the headline of the front page of the newspaper, as it has to be, 18,000 children die every day! It's not a car accident of one victim. It's 18,000 daily! This was on page number twenty-one, which means that twenty pages of the same newspaper of that day were considered more important than this. Twenty pages, and this is the whole article, a small piece of paper, not even a picture. So what have we learned? Still, I am an optimist. In that dark tunnel, the six years of World War ? ?, were some stars that gave us hope and showed the light at the end of the tunnel. I speak about the Righteous among the Nations. For example, [Sempo Sugihara], the Japanese diplomat in Vilnius, capital of Lithuania, who issued thousands of visas for Jews from Lithuania and Poland to go to Macau, to the Far East and to survive. He was a hero of that time. Raoul Wallenberg, Oscar Schindler, people from different nations: They didn't know each other, and they were not a group. Each one was an individual, but in common they shared character and a good heart. [They were] people who were ready to endanger themselves, and they paid sometimes with their lives, like Raoul Wallenberg, in order to save people they didn't know - women, and elderly people, children and babies - from the devil. These personalities give us hope. If the world would not have kept silent at that time, then the boulevard of trees at Yad Vashem, the institution I represent here today as it s Council Chairman, would look different today. There is a boulevard there, where each tree carries a name of one of the Righteous I mentioned and many others I did not. If the world hadn't kept silent, or if for example the Vatican would have said a word to condemn anti-Semitism and to fight Nazism, then this boulevard would be so long that the trees would stretch from Yad Vashem in Jerusalem to the UN building in New York. If only the world would have behaved properly, as it had to do. Unfortunately, those were dark, bad times. Very few behaved as they were supposed to. Ethics and morals were not the first priority of mankind in 1933, nor from 1939 until 1945. Finally, the free world came to liberate us: the Soviet Union came to Auschwitz; General Patton came to us in Buchenwald. Dwight Eisenhower, Montgomery, De Gaulle, the Allies. We thought: "Messiah!" For us this was a new chapter in life, a new creation. And we do hope that the phenomenon of our liberation is a sign and a symbol, and example for a new world, a world of friendship, of understanding, of peace and of love. This is my prayer to the Lord Almighty: " Oseh shalom bimromav", The Lord who made peace in heaven", "Hu ya'aseh shalom aleinu", "He will create peace among us and the entire world", and let us say, amen.